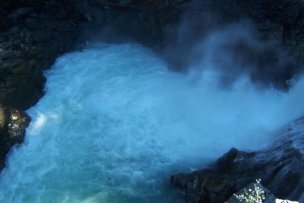 Whistler-Summer is a continuation of whistler summer activities. 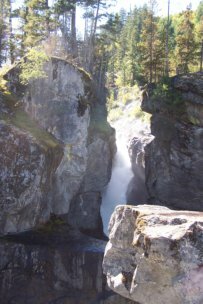 At the end of the picturesque trail you'll find the unique falls. Here's a collage of pictures. 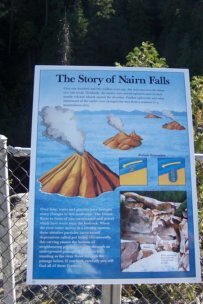 You probably won't be able to read the detail on this sign - so to discover the magic of the geologic formation of Nairn Falls you'll have to do the hike. Cheekamus Lake trail is a fairly flat 3 km to the lake and you can continue along its shore for about another 1 km. Access to the trailhead is by a logging road from the highway just outside Whistler. Singing Pass is a great trail impinged on somewhat by the new Peak to Peak Gondola. This trail is even better if you can somehow get a lift to the real trailhead not just to the old forest road. This avoids 4 km of boring hiking. But the old road no longer allows car access. A more detailed description can be found here. Musical Bumps Trail is a good way to do a loop instead of returning on your tracks, you can continue from Singing Pass up and over the Musical Bumps to the Whistler Roundhouse and take the Gondola back down. To complete this in one day you would want an early start since it will take 7-10 hours depending on your fitness level. An easier approach is to take the Village Gondola up Whistler and do the route in reverse. In this direction the Musical Bumps lead past Piccolo, Flute and Oboe summits and into Singing Pass for the descent. Be sure to have a good trail map for the route from Whistler Roundhouse to the top of Singing Pass. Let's go a bit afield for a minute and look at Black Tusk Trail is invigorating with about 2600 foot elevation gain. About 7 km up the trail you can swing left towards Taylor Flats and Black Tusk or right towards Garibaldi Lake. In fact you can loop from Black Tusk to Garibaldi Lake or vice-versa so take your pick. It's not a bad idea if weather permits to take a cold dip in the lake to rejuvenate your muscles for the descent. We have gone to both destinations and returned to our truck in a day. And then you can drive back to Whistler for a hot soak. At the lower elevation of the Valley, back in Whistler, there is a beautiful paved (tar) 35 km trail for walking and cycling. The Valley Trail runs from Alpha Lake in the northeast to Green Lake in the southwest. Skirting a golf course and leading through forested areas, it is a trail where we have occasionally seen black bears. Generally the tricks to avoiding trouble with black bears on a trail are to never get between a sow and her cubs; always leave a black bear an escape route; make some noise as you move through areas where your view is blocked – generally they are as eager to avoid you as you are to avoid them; check with Whistler Information about any problem areas; they are more likely to be nocturnal so don’t go at dusk, or at night. But don’t let this steer you away from a ride or a walk. 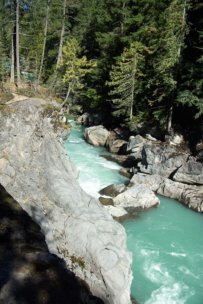 In 30 years of Whistler summers we have only seen black bears on this trail on two occasions. There are excellent mountaim biking and walking trails near and around Lost Lake. This lake, with its good swimming, is in the Valley and an easy stroll from the Village. These trails link into the Valley Trail so you can do a loop circuit from the Village to Lost Lake, to Green Lake where you can stop at the Clubhouse at Nicklaus North Golf Course for an excellent, well-priced brunch on the patio overlooking the lake. Reinforced you can continue on to Rainbow Park on Alta Lake, around the lake and then swing left to head back to the Village. The Whistler/Blackcomb Peak to Peak Gondola is a great adventure in itself. You can take a lift up Blackcomb or a gondola up Whistler and the walk to the Peak2Peak to cross over. Short hikes near either end of the P2P and brunch at one peak and a late lunch at the other before riding a lift down the mountain provides an easy but interesting alpine experience. How about roaring down a mountain? Try Whistler Mountain Bike Park lift tickets provide access to over 200km of lift-serviced gravity fed, adrenaline fuelled downhill madness for those inclined to wrap themselves up bike body armour and take the plunge. It's a lot like downhill skiing on steroids and 2 wheels. Whistler is famous for its great Dining. Over 90 restaurants in Whistler Village tempt you to try the tastes of the world. They range from bistros, pubs and cafés to fine dining experiences – all in the multi-flavour, multinational Whistler experience. And the beauty is that you can walk from your timeshare to the restaurant of your choice, eat a great meal and wash it down with appropriate libations without worrying about having to drive home. Or if you want to keep the night alive there is lots of NIGHTLIFE. If you’re into nightlife Whistler has lots of it. In fact you’ll meet people, guests and Whistler staff, from all over the world, at the night spots. Check it out here. So you can see that there is lots to choose from at Whistler. Never a dull moment for anyone of any age. 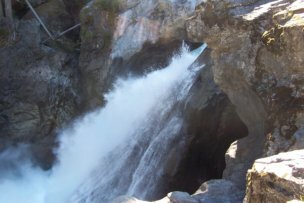 And if you're still up for more the next day - or you just need to sweat out last night's wine - here are some more alpine trails om Whistler and Blackcomb mountains. To return to the first page on Whistler activities click here.